Robert Aldrich's Grand Dame Guignol followup to What Ever Happened to Baby Jane? is quite a shocker for an upscale 1964 Hollywood picture. What it lacks in credibility or subtlety, it makes up in high-powered gore and taut suspense - at least the first time around. For repeat viewings, the able histrionics of Ms. Davis and company can be appreciated for their basic professionalism - it's just plain fun seeing an Oscar-winning great lady like Olivia de Havilland deal with a severed head and dispose of a corpse in a swamp. 1964. Charlottte Hollis (Bette Davis) has lived for almost forty years as a recluse in her father's Louisiana mansion. In 1927, she was the leading suspect in the beheading murder of her lover John Mayhew (Bruce Dern), a married man. Now road builders want Charlotte out of the house and Charlotte's 'poor relation' cousin Miriam Deering (Olivia de Havilland) and doctor/friend Drew Bayliss (Joseph Cotten) have come to try to get her to surrender the property without more embarrassing scenes. But Charlotte is experiencing weird hallucinations that focus on the legendary crime; and most of the parish already thinks she's insane. Robert Aldrich's career had been a rocky one before he got smart with his "battle of the battle-axes" Hollywood Gothic What Ever Happened to Baby Jane? That film enhanced the new respectability given the horror film by Psycho by introducing a broad element of self-referential humor. Bette Davis and Joan Crawford played fictional roles but the film teased us with the notion that Baby Jane also represented a real feud between bitter enemies. In 1962 both Davis and Crawford were still in total possession of their acting skills, and the movie invented 'hag horror' by encouraging them to send up their glamorous images with a show of grotesquerie. Smelling a gold mine, Aldrich and his key writer Lukas Heller tried to repeat their winning formula but Joan Crawford backed out in the middle of production, forcing a replacement in the person of Olivia de Havilland. 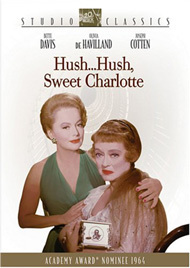 What the quasi-sequel Hush... Hush, Sweet Charlotte gives up by losing Crawford, it gains in freshness. de Havilland's saccharine Miriam Deering plays off her image as the sweet Melanie Wilkes from Gone with the Wind, giving the bloody murder story a charge all its own. Hush... Hush, Sweet Charlotte needs the star power because as a thriller it really isn't all that special. Big parts of the story are cribbed from Baby Jane and H. G. Clouzot's Les Diaboliqes, and the creepy murder plot is a lengthy succession of red herring characters and illogical (or impossible) conspiratorial maneuverings by the bad guys. The slowly paced film is far too long and the script reinforces every plot point and expository fact not once but at least two or three times. Aldrich's suspense technique almost guarantees the film won't be frightening on a second viewing ... every other scene is a drawn-out tease, waiting for murderous attacks that never seem to happen. Even after the carnage kicks into high gear, nothing is allowed to be implied or presumed -- the talky script covers every point as if Sweet Charlotte were a radio show. That doesn't mean that the film is dull, especially not the first time through. Davis and de Havilland do wonders in keeping their characters interesting and mysterious, no matter how literal or illogical the writing. 1 Davis puts a lot of effort into Charlotte's various mental states and retains the sympathy of the audience despite many unlikeable acts -- threatening construction workers, flying off the handle whenever she's contradicted, etc.. Olivia de Havilland seems sincerely concerned and maintains a credible potential for being a misunderstood 'good guy' all the way until the third act. Aldrich also populates the film with a great supporting cast. Everyone loves the sassy antics of Agnes Moorehead as the unbelievably frowsy housekeeper, Velma. Victor Buono and Bruce Dern are suitably creepy. Wesley Addy is a friendly sheriff and Mary Astor (in her last film) appears as a tired woman at the end of a lifetime of suffering. Best of all is the film's most prominent red herring, an amateur investigator played by Cecil Kellaway. He's eventually revealed as a foundation of civility, and almost becomes a romantic possibility for Bette Davis. No wonder Joan Crawford went to such extremes to get out of Hush... Hush, Sweet Charlotte -- the film not only redeems the Charlotte character, it makes her into a Guignol heroine. Fox's Studio Classics DVD of Hush... Hush, Sweet Charlotte is a handsome enhanced copy of this moody B&W shocker and its first presentation on video in a proper aspect ratio. The crisp audio track showcases Frank DeVol's score, including the popular title tune that became a radio hit when sung by Patti Page. The extras include a teaser, a trailer and three television spots. The commentary is by the writer of this review. Speaking about a single film for 133 minutes was quite a challenge, and anyone willing to sit through the commentary will get not only a production rundown on the movie but mini bios on most of the cast and a lot of analysis of the film from the POV of its director, its place in the history of horror movies, and the 60s phenomena of horror films starring big-time actresses past their career primes. Fox's Studio Classics-style cover illustration shows both leading ladies in a neutral pose, giving no hint whatsoever that a horror movie is hidden inside. The package text equates unsightly old age with horror by calling Agnes Moorehead's Velma "the scariest inhabitant of all." With youth culture more exaggerated than ever, any show with people who don't look like magazine-cover idols now probably qualifies as horror. 1. (spoiler) For instance, why the heck would Miriam Deering try to approach Jewel Mayhew (Mary Astor) as a friend, when they've have been in a murderously adversarial blackmail relationship for 35 years? For whom is Miriam grandstanding? That's just one of a half-dozen scenes that on a second viewing seem like a cheat. Why do Dr. Drew and Miriam go through all the difficulty of their last grand charade to drive Charlotte over the edge? Everyone believes Charlotte to be crazy already. Wouldn't it be easier just to frame her for murder?